Increase your productivity in levelling applications with the Leica Rugby 620 construction laser. Designed for general contractors who mainly perform formwork and concrete applications, the Rugby 620 rotating laser level offers a professional but simple levelling solution with an outstanding price-to-quality-ratio. Forget about costly errors, rework or downtime thanks to the fully-automatic operation with the Leica Rod Eye receivers. Concrete pouring, formwork levelling, setting foundations and footings has never been more efficient. 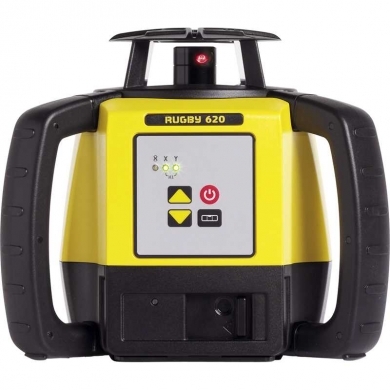 The professional Rugby 620 laser level offers contractors application flexibility, allowing them to perform single slope applications using the manual grade control. Rugby 620 is a perfect laser tool for those contractors who occasionally need to do simple slope tasks like driveways, landscaping and parking areas. Depending on the type of the job, Rugby 620 offers operating range of 500 m with the Rod Eye Basic, and 600 m with the Rod Eye 140 and 160 digital receivers.